We receive a number of questions from our customers about goCabinets. To help save you time, we have answered the most common questions we get asked for you. Once you have signed up at https://gocabinets.com.au/gocabinets-membership-signup/ you will have instant access to goCabinets. Simply sign in using the email address that you signed up to, along with the temporary password that is emailed to you upon sign up. If you haven’t received your log in information in your email inbox after a couple of hours, check your spam/junk folder or try resetting your password here: https://gocabinets1.com.au/resetPassword.php using the email address that you signed up with. Simply reset password here by entering your email address that you signed up to goCabinets with. You will then receive an email with a new password to enable you to be able to log back into your account. I have signed up to goCabinets but haven’t received my password. Although we do our best to get you your sign up information as soon as possible, sometimes things get held up in cyberspace! Firstly, check your Spam/Junk folder of your email inbox to ensure that your welcome email hasn’t accidentally landed here. If you still have no luck, go to https://gocabinets1.com.au/resetPassword.php and enter the email address that you just signed up to, you should receive a new password shortly that you can then use to sign in to your account. Does goCabinets actually make the cabinets? 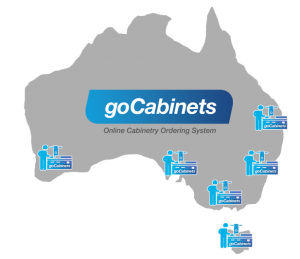 goCabinets is the online interface to enable manufacturers to take orders from customers online. So it is not ‘goCabinets’ that cuts your order, but rather the goCabinets manufacturer that you have been assigned to. Are prices for cutting only or does the cabinet come assembled? When creating a new job, you have the ability to select if you want it to ‘include Assembly cost’. If you select this option, then your products will come assembled. If you do not select this option, then the price of your order will not include your products being constructed – this is the cheapest way for you to order products from goCabinets. Please note, not all manufacturers allow for this option available for selection. What is the time frame on a goCabinets order? As a general guide, most manufacturers have a lead time of 10-15 business days. This is dependent on the complexity and size of your order. Does goCabinets produce cut lists? With goCabinets, there is no longer any need for confusing cut lists. Once you have entered your job information and selected your products, your order is simply downloaded and processed through your manufacturer’s software. It is as easy and as quick as that! Does goCabinets make 3D drawings? Is there a goCabinets app? At the moment, there is no app available for goCabinets, however you can easily save the web address as a button on your device’s home page for easy access. Please refer to your browser for instructions. Is goCabinets compatible on Mac, mobile, iPad & other tablets? Yes, goCabinets can be accessed through any web browser. Where are goCabinets manufacturers located? Can I buy cabinets in my area? Can I order specialised cabinet products on goCabinets? Simply sign up to become a member to gain instant access to our extensive library of available cabinetry products that you can order. Each product is customizable, and you also have the ability to submit variation requests to your manufacturer for them to consider. If the cabinet product you desire is not in our catalogue, please contact us on info@gocabinets.com.au for further guidance. Is goCabinets only for cabinet makers & builders? No, although our product is designed primarily for cabinet makers and builders to use, you are more than welcome to sign up and utilize goCabinets for personal projects. Fill out this form and the goCabinets team will be in touch with you promptly.